The SM2040-37 is a small, highly linear amplifier designed for multipurpose use in military and wireless applications. 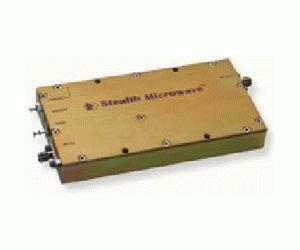 Operating from 2 to 4 GHz, the amplifier is suited for laboratory use as well as UMTS, ISM, MMDS, and WLL applications. Output power at P1dB is +37 dBm (min.) with a +47 dBm (min.) OIP3. Linear gain is 37 dB with ± .75 dB flatness across the entire frequency band. The unit operates from +12 Volts and consumes 2.9 Amps., (+10V operation is available). Dimensions are 5.0 x 2.5 x .563 inches. Features include Mis-Match Protection, Single Power Supply Operation, Over Voltage Protection, Thermal Protection with Auto Reset, and Logic On/Off Control. The module is also available as a lab unit or in 19” rack mountable form.